Change is inevitable. Your operating system and applications write and re-write data constantly. A power surge or voltage drop during disk writing can mess things up. You consciously or accidentally move things around or change settings. You add new applications that do unexpected things. Maybe you catch a virus. Things get out of whack. If only you could put them back the way they were! That's what a disk image is for. A disk image is a single file that contains a perfect copy of your hard drive as it existed at a given point in time. Store the disk image safely somewhere else. Reformat your hard drive, if the mess gets that bad. Copy the disk image onto the formatted drive. Presto! You're back to that point in time, with everything just as you had it. Keep in mind that a backup image does not allow you to restore selected files -- it's all or nothing. So I suggest you also read my related articles Free Backup Solutions and Online Backup to familiarize yourself with other options that will allow you to backup and restore individual files or folders. When Should You Make a Disk Image? After installing an operating system and all its available patches for the first time. This gives you a clean base upon which to install applications. Before installing major applications like Microft Office, in which any number of things can go wrong. Before downloading and installing Windows Service Packs, in which any number of things can go wrong. At variable intervals depending on how much you add, remove, and rearrange data and applications. Once a month, a quarter, whatever. How Do I Make a Disk Image? Some flavors of Windows Vista and Windows 7 can make "system images" which are backup disk images. To create a system image on Windows Vista, Click on Start / Control Panel / System and Maintenance / Backup and Restore Center. Then click on "Back up Computer", and follow the steps in the wizard. On Windows 7, you'll need to click on Start / Control Panel /Backup and Restore, then click "Create a system image". Note that this system image feature is available only in Vista Business, Enterprise and Ultimate editions, but not in Vista Home Basic or Vista Home Premium. According to reports I've seen, System Image will be available in all versions of Windows 7. Macrium Reflect is a totally free disk imaging solution. Norton Ghost is a heavily marketed and consequently widely used disk image utility. It's also priced at $69.99. Users have mixed opinions of it. Acronis has a variety of disk imaging solutions designed for basic home use up to enterprise-wide IT management. Free trial versions are available for downloading. I've used Acronis on my office computers for several years and it works well for me. Most recent comments on "Hard Drive Backup Image"
Image backup is only good if you can restore from a bootable CD (i.e., you don't have to FIRST install Windows). In the past I've used Retrospect; I understand current versions are not too good... and I think you had to install windows and retrospect to do that. I now have OneTouch 4+ drives, and it comes with Maxtor Manager. I have tested restores from a bootable CD that they provided, and successfully done it... as has my sister. I don't know if the program works with other hard drives. I use that in combination with daily incremental backups to the same backup drive. (When I do image backups I do it BOTH to the external drive that I have always connected and always on, AND to a second drive that is normally powered off. I do them when I take the computer on the road; also if I'm doing some risky installation. Note that MaxtorManager's incrmental backup is picky -- it won't do "system" files... of course not open ones. So I basically do my data directories. Included with the data directories is a directory where I save downloaded programs, so I can reinstall them as needed, when I migrate to a new computer, etc. I'm one of those who love Ghost (it's the only Norton product I do like...). I can ghost or restore a 160gb HD in under 20 minutes. I can restore selected files- it comes with a utility that looks just like Windows Explorer ("file manager") and I can either view or restore from there. Using built in compression, I can store 4 images of my HD on a similar sized drive. Ghost also allows for backup to CD/DVD. Backup/restore times obviously will be longer. I have used it for a long time and have twice installed a new HDD and restored the drives 3 partition images from 3 DVD sets, which are directly bootable. Inexpensive and great customer support. Once I accidentally deleted the partition from my USB HDD and their Boot It NG has a partiton restore function which can be used independent of the boot manager, so I recovered all the files on that HDD in seconds. Kudos to you for this recent article on system backups. It's been my experience that most folks take this far too lightly and rarely, if ever, employ a good backup strategy. Using these two applications in tandem makes restoration a snap and avoids the necessity of re-installing Windows should something go haywire. Oh, and don't forget to schedule your drive image backups on a regular basis. Once a month should work nicely for most folks, but power users might opt for a more frequent schedule. Above all else, don't just think about backing up your hard drive - DO IT! I have been using Macrium Reflect for some time, with no problems. It probably is not as fast as Ghost, but I tend to shy away from Norton products. The full edition of Macrium Reflect ($39.99) does allow individual file restore. It is possible to use your computer while performing an image backup. Image for Windows by terabyteunlimited.com employs a utility that caches disk writes while the backup is running. Therefore, you can still surf and check email with a backup in progress. Additionally, they also provide a utility that allows you to browse an image backup and restore individual files. You can backup/restore to/from bootable CD/DVD, external USB HD or a network drive. A bootable DOS and Linux CD allows restores from external USB or network drives,without having to reload Windows. And for those blind users (like myself) the program is very screen reader friendly, with the added benefit of being able to perform a restore from DVD with no sighted assistance. I believe the cost of the product is $35, much less than Ghost. Hi Bob thanks for your news letter. I use Acronis True image for back up and I am very happy with it. I only use Acronis to backup my hard drive but to backup my data I have "My Documents" on a second partition on my first hard drive and I back them up to a partition on my second hard drive with SyncToy http://www.microsoft.com/downloads/details.aspx?familyid=C26EFA36-98E0-4EE9-A7C5-98D0592D8C52&displaylang=en It was designed my some Microsoft Employees in their spare time for their own use and they have made it freely available from MS but it is not supported by MS. I have a LaCie 8 gig external hard drive. I saved specific files there several years ago, now I want to delete them and resave similar files for easy recovery. The problem is, when I went to look for a lost file, I was unable to open the files that were on the external drive. I called lacie and got no help. Anybody have a similar experience or can shed some light on how I can do this and succeed this time? Tried to see it today but it appears to be unavailable now. Can anyone advise another link to see it please? Also with Acronis, at least, the Volume Shadow Copy seems to be necessary which baffles me. WARNING For the present, avoid SyncToy mentioned by Sandy B on 6 Aug 2009 if you're using NAS...there's a warning on the Microsoft download site http://www.microsoft.com/downloads/details.aspx?familyid=C26EFA36-98E0-4EE9-A7C5-98D0592D8C52&displaylang=en about a big file corruption issue. I used the built in backup utility in Windows XP found in system tools. I wanted a backup so that in the event of a crash I can reload windows and my programs with all the updates. I chose the option of selecting files and folders to back up because I didn't want to include my personal files. I unchecked My Documents etc. I did check system state. The utility did not make me a boot disk as it would if I chose to back up everything. Will I still be able to restore Windows with updates and all the programs with the backup image that I created? EDITOR'S NOTE: If you don't have a boot disk, with a way to start the backup program, and restore from the backup, then no. Yes indeed, backup image is a good thing to backup your hdd and if you can also store it online is even better so you don't have to worry about external hdd and other craps. If you are searching for a software that can to backup/restore process fast you could use http://www.dmailer.com/dmailer-backup.html and they also offer online storage services up to 3gb as a free member and other larger packs at good prices. I think I've found the solution to system backups that also allow me to never worry about viruses ever again. The solution is a program called Deep Freeze: http://www.faronics.com/enterprise/deep-freeze/ -- This program freezes your drive so any changes made to it on the next reboot are reversed. This means you must save personal files to an external drive otherwise they get wiped on the next boot. You can "thaw" a drive if you need to make system changes - such as install new software, etc. After an install, make sure everything is good, and then "freeze" it again. An IT guy I know told me about it and I feel like I've just found buried treasure. Acronis downloaded 11.8.2011 DON'T WORK! There is no way to get help from them. There is an error when running the program. Tried it on several different computers with different downloads and same result... error. Uninstalling it is another nightmare. Don't use Acronis if you have Win XP, I don't know if other versions may work. Am still looking for a good program and don't mind paying for it. 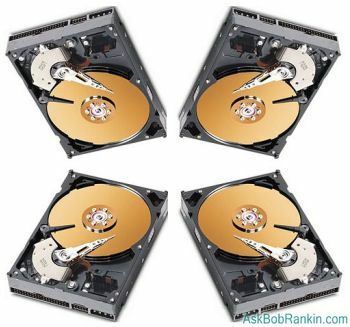 Using a 3TB external drive I'd like to make an image of four (4) computers and back them up in increments as well. Is this possible to seperate these images on one drive?